Libyan Group Denies Role In U.S. Consulate Attack Ansar al-Sharia, the ultraconservative armed Islamist group, is accused of taking part in the attack in Benghazi that killed four Americans. The group denies it participated, but its leadership has stopped short of condemning the attack. 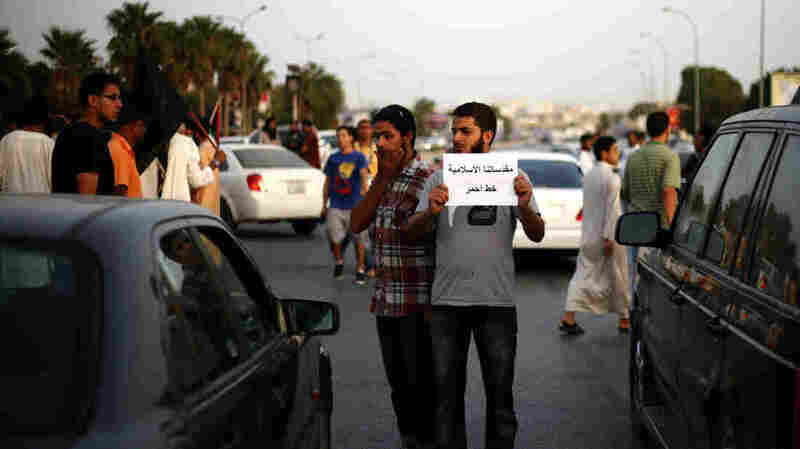 A Libyan follower of Ansar al-Sharia Brigades carries a placard reads in Arabic "our Islamic holies are red line," during a protest in front of the Tibesti Hotel, in Benghazi, Libya, on Sept. 14, as part of widespread anger across the Muslim world about a film ridiculing Islam's Prophet Muhammad. It has now made itself a vital part of the patchwork security apparatus in Libya's second-largest city, guarding hospitals and solving tribal and family disputes. It's certainly not a secret cell. Its headquarters are marked with a sign outside, as are its vehicles. But if the United States had hoped to remake post-Gaddafi Libya into a secular democracy in its own image, it's not a vision these men share. They agreed to a rare interview with me. "We are trying to show the people that Islam is the solution to their problems, said Mohammed Zahawi, the head of Ansar al-Sharia. "As for those bankrupt calls for Western democracy, liberalism and secularism, what did democracy give to the West? Social collapse, moral collapse, economic collapse?" The West, he said, has nothing to offer Libya. As other Libyans celebrated the country's first free elections, this group rejected the democratic process entirely. In their interpretation, only God's law applies. Ansar al-Sharia follows the most literal interpretation of Islam — a narrow view that would ban mingling of the sexes and what they consider Western vices. Their rejection of any U.S. hand in reshaping Libya is so vehement that they're willing to relinquish Libya's lifeblood: its vast oil reserves — the reason they believe the Obama administration helped them in the first place. "They can have the petrol if they want, so long as they just leave us alone," Zahawi said. "We waive our rights to petrol, let them take it, just don't intervene in implementing our religion and Islamic law." This talk strikes fear among not only Western observers but also many Libyans, even in the conservative city of Benghazi, where many worry about the group's intolerance. While most Libyans eagerly share their stories with Western journalists, the leaders of this group would only meet with me on the condition that my face, hands and hair were covered. Even then, although I was shrouded in black, they only addressed the male translator and turned their chairs to avoid looking at me. As unpopular as their views may be among fellow Libyans, their role is too important to drive them out. The gaping security vacuum and a weak transitional government has led to rising crime and drug use. Ansar al-Sharia has stepped in to fill the void, helping residents sort out family problems and solve petty crime in the total absence of a working justice system. That's the role Ansar al-Sharia wants to emphasize. It denies all links to al-Qaida and any role in the attack that killed the U.S. ambassador and three other American staffers. The accusation, Zahawi said, is just part of a propaganda war by liberals to undermine them. "The liberals and secularists were all raised in the West. They were raised in openness, nakedness and decay. They know that in an Islamic state, they can't get to their vices. That's why they are waging a war against Islam," Zahawi said. Another leader of the group, Nasser Tarshani, dismissed claims by defacto head of state Mohamed Magariaf that al-Qaida used some members of Ansar al-Sharia to carry out the attack. "If he has proof of that, let him show it," Tarshani said. "Now any political movement that wants to win, they use the al-Qaida scarecrow. We know this game. It's obvious." They're not interested in provoking the West right now. At the same time, they definitely don't consider America a friend and have no interest in pursuing warm relations with the country that was instrumental in toppling their old oppressor. "We do not want to enter a struggle that we have no strength for; we are trying to introduce the just and right Islam," Tarshani said. Any American attempts to retaliate for the death of its personnel would backfire, the leaders say. At that point it could even draw al-Qaida into the fight over the future of this fragile transitional nation.